Weekly Happenings: This past week was rather interesting, in that Paul took both Thursday and Friday off (more about that later). The first part of the week was normal as far as our normal schedule is. 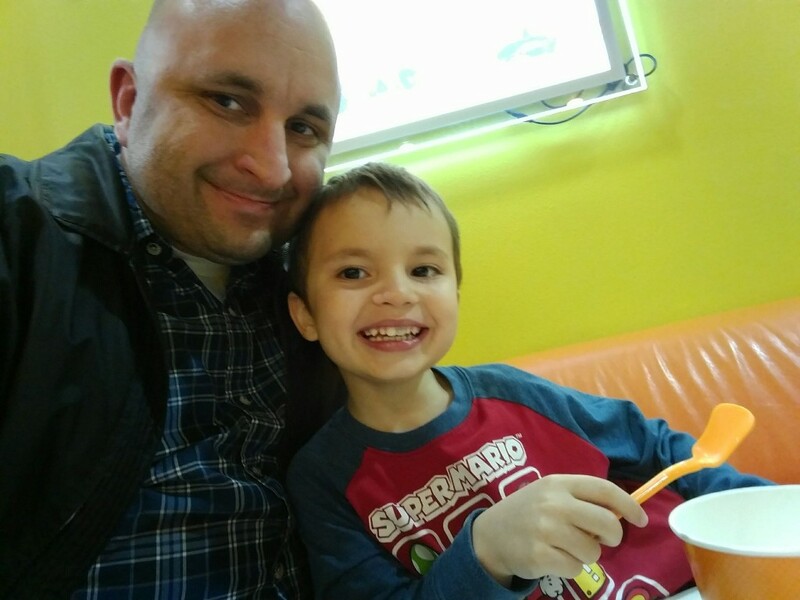 On Wednesday, I did go to a baby shower so Paul and Joseph had quality father-son time (including a trip to Orange Leaf for frozen yogurt). Thursday, Paul spent the majority of the day working in the yards (Joseph and I were out with him for some of the time, but I spent most of the time entertaining Joseph inside and teaching my piano students). Friday night Paul had a camp out, so the earlier part of Friday was spent with Paul doing homework and Joseph and I running errands. 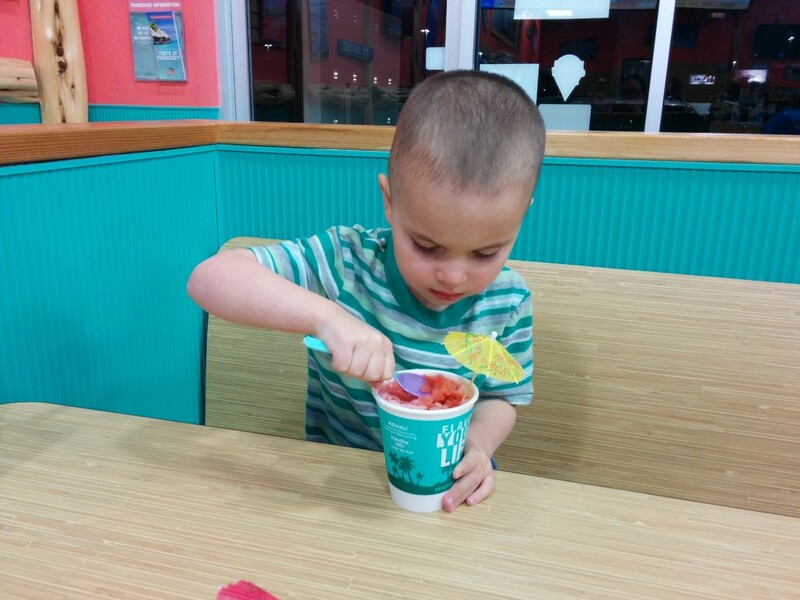 Joseph was pretty sad to see Paul go on Friday night, so I took him out for shaved ice. He perked up right away. 🙂 Yesterday, Paul got home from the camp out, showered, and then he, Joseph, and I went to a book signing for one of our favorite authors (Brandon Sanderson). We each had a new book of his to sign (and I also had a crustier copy of another of his). It was neat to get to meet him. Then we headed home (I was a bit tired since I decided yesterday morning to pull all the grass from the planter boxes under each of the trees in the back yard…I almost pushed myself too hard with my back but luckily didn’t injure myself by pushing myself too much) and got Paul’s old lap top since someone responded to his Craigslist add to buy it. With the money we got from that, we went to Best Buy and upgraded my lap top (and now Joseph gets to mess around on my old lap top). The trickle-down effect is great! The Weekly Weather: It’s been warm and sunny. I think it’s official (even if the calendar disagrees): winter is done for and spring has arrived (in South Texas, at least). What Paul’s Been Up To: More about his yard work day: Thursday morning, we headed to Lowe’s to get some plants, more wood chips and potting soil, and a couple kits to change sprinklers to drip lines (do you see where I’m going with this?). He then cleared out Joseph’s sand box (which Joseph hadn’t used for quite a while), added some soil, and planted a few things (which we’ll hand water). 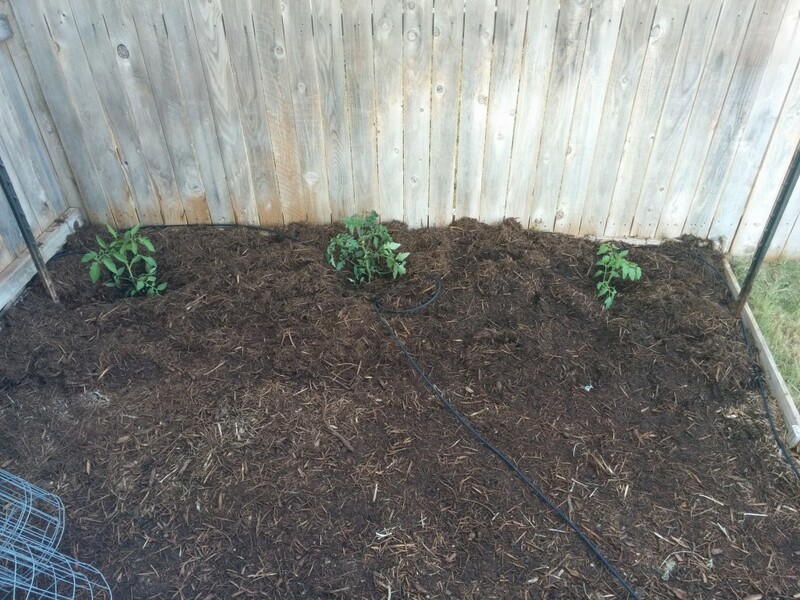 He also ripped out all the old, dead tomato plants and planted fresh ones. He changed the sprinkler heads out that are closest to the tomatoes (and originally pointed into the garden bed anyway) into drip lines, mowed both yards, and then put down weed & feed (a sure sign that spring is on its way). I’m grateful for all of the work he does to keep our yards looking nice! Friday’s camp out was an overnighter at Government Canyon (the state park that’s just a couple miles from our house), so Joseph and I dropped Paul off and then he hitched a ride home with someone on Saturday morning. What Sarah’s Been Up To: Not too much out of the ordinary, actually. I’ve been enjoying the weather. I think I like all of the seasons in San Antonio (yes, even summer with all of its humid ickiness has a few selling points), but fall and spring are my favorites, by far. The air is so fresh (and even smells good, if that makes any sense) and the temperature is just right. Right now, as I sit typing, I can glance up and look out my storm door to see the beautiful blue sky and puffy white clouds. Having grown up being surrounded by mountains, the lack of mountains and “big skys” in South Texas took some getting used to, but now I love it and even feel a bit closed-in whenever we go back to California to visit. 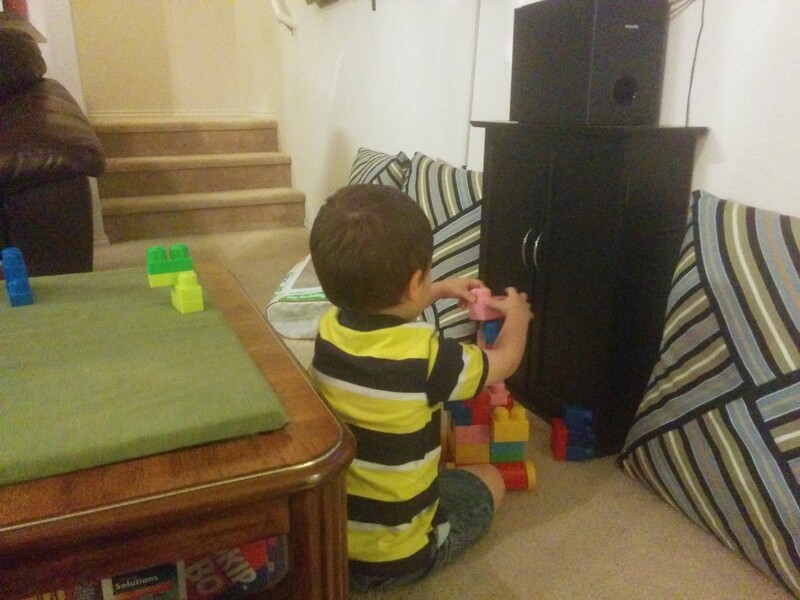 What Joseph’s Been Up To: Nothing really out of the ordinary for the little dude this past week. We did take him to get his hair cut on Thursday morning (before our trip to Lowe’s) so that he’ll be cooler for the warm weather. Oh! 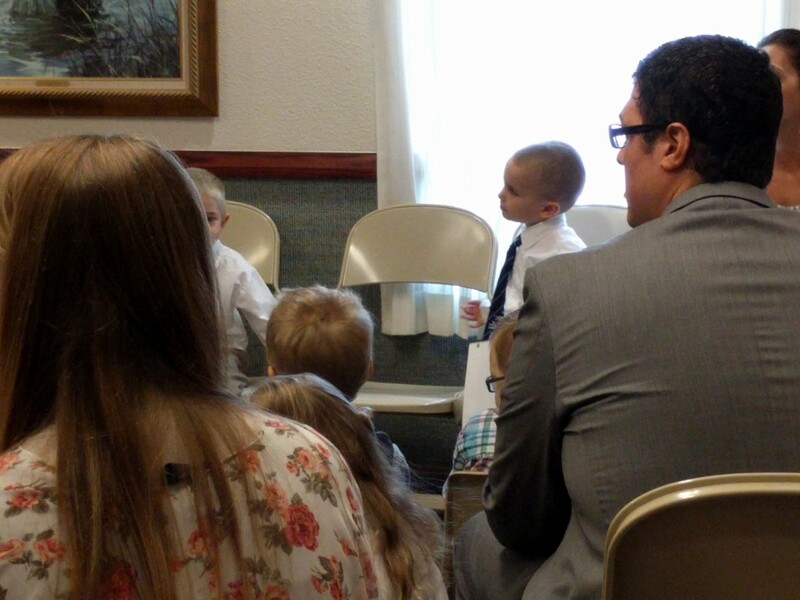 He got to give his first talk in Primary today. He rocked it! When I wrote it out, I tried to use words that he understood (and could pronounce) and consequently, he read a good 95% of it on his own. It did my heart proud! 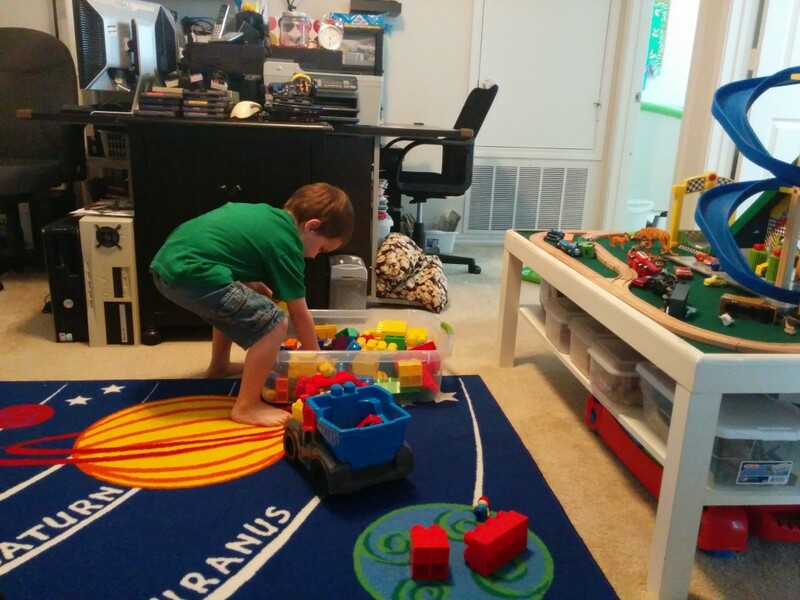 Oh, and early last week, a friend of mine passed down her kids’ Mega Bloks (since they’ve sort of outgrown them) to Joseph and he’s been having a blast building new stuff. Digging through his new treasures. 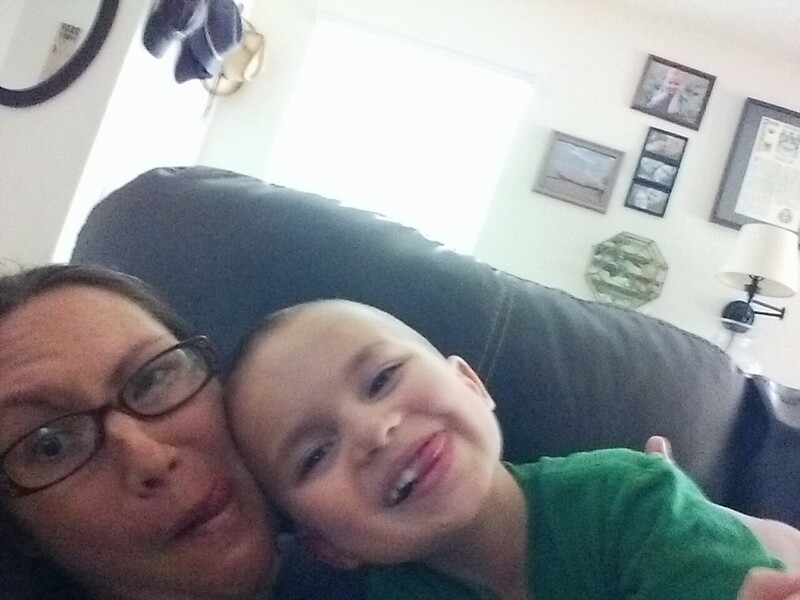 I got a text with this picture while I was at the baby shower I attended. He sure loves his Daddy! He got rather brave with his frozen yogurt choice (up to this point he’s always had vanilla with fresh strawberries) but this trip he decided on coconut frozen yogurt with chocolate chip cookie dough bits, sprinkles, and Whoppers. I laughed really hard when Paul told me! 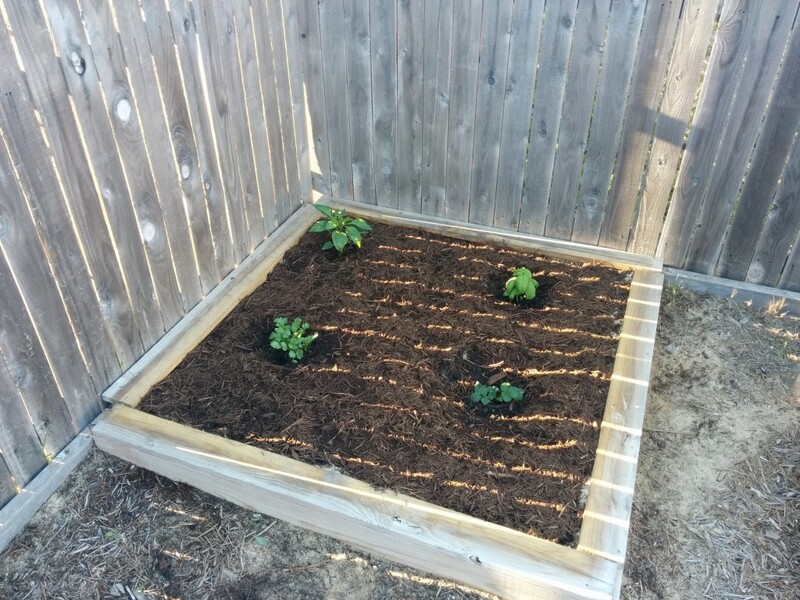 Joseph’s sand box-turned-garden. He’s expressed interest in helping with gardening, so we picked out a few plants and he’ll get to help water them. The two in the back are a yellow bell pepper plant and basil, and the two in the front are cilantro and a strawberry plant (Joseph was rather insistent that we get a strawberry plant). The new tomato plants with the drip line system that Paul set up. I’m so grateful to have a husband that knows how to do this sort of stuff! We’re also eventually going to plant pumpkin seeds (with their germination and maturation cycles being what they are, we need to wait a few more months before planting if we want pumpkins for the fall). 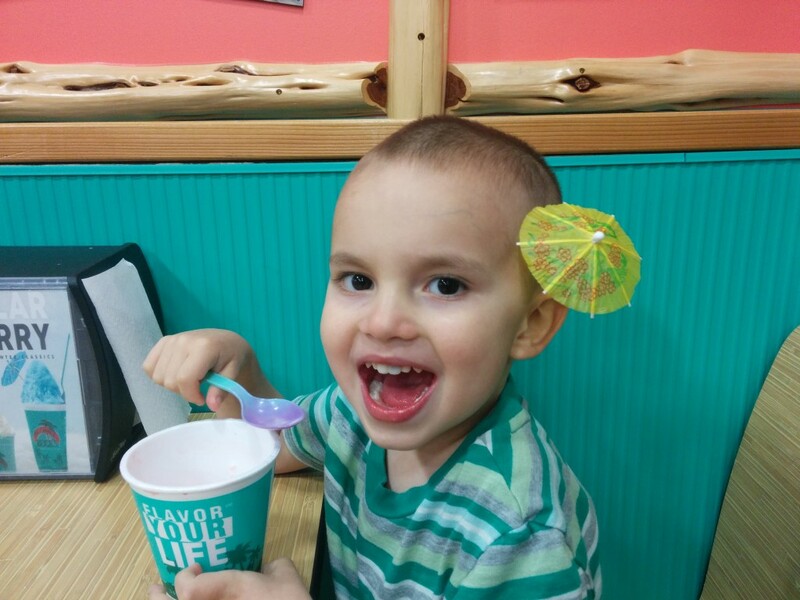 Digging into his shaved ice at “Ahamba Bucks” (Bahama Bucks). He was also brave here…he normally gets vanilla shaved ice with vanilla ice cream on the bottom, but this time he got strawberry shaved ice with vanilla ice cream on the bottom. 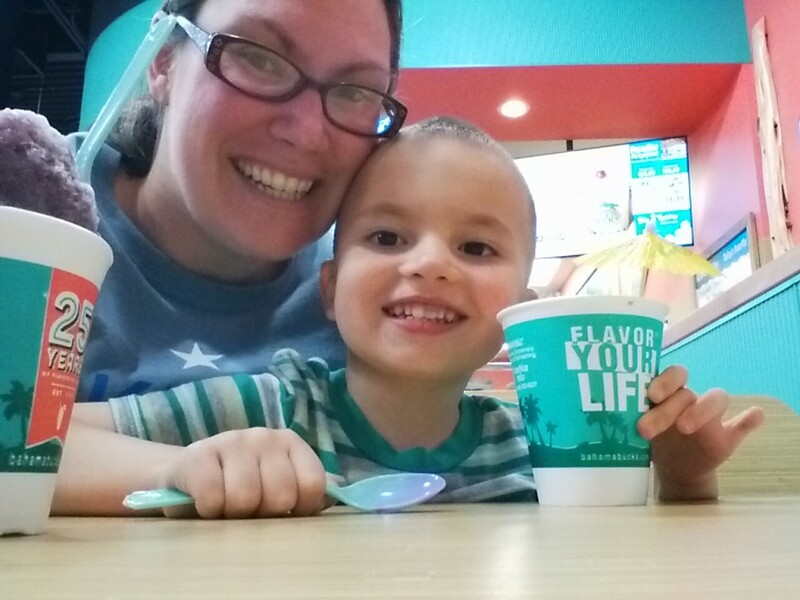 He thoroughly enjoyed our momma-son date…even though he kept giving himself brain freezes from the shaved ice and ice cream (I even noticed goosebumps on his little arms…when we got home, he asked to get into his long-sleeved, long-legged fleece pajamas, hahaha). Getting ready to give his talk.